Get ready for an incredible day mixing sun, relaxation, a tasty lunch and a mind-blowing speedboat ride that you won't forget in a hurry! Located within easy reach of Orlando, a trip to Clearwater Beach is an ideal antidote to the busy theme parks. You will have plenty of free time to work on the tan and enjoy the warm Gulf Coast waters. After an early pick-up in Orlando, sit back and relax as your driver does the hard work and soon you'll be kicking back on Clearwater's famous sugar-white sands or perhaps taking a refreshing swim in the ocean. Enjoy a tasty lunch overlooking the white sands and a chance to unwind before heading over to the mighty Sea Screamer. The varied menu includes sandwiches with fries and coleslaw; Greek, Caesar, Chicken or Tuna salad; Pasta; Pizza; Fish & Chips. The kids menu includes Burgers, Hot Dogs, Chicken Fingers or Fish & Chips. 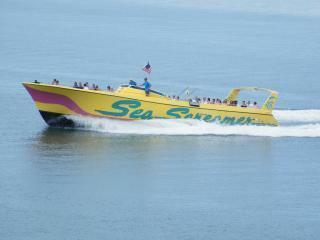 Hold on tight for a 60-minute long ride on the East Coast's largest speedboat through the beautiful Gulf of Mexico. The Florida coastline is pretty spectacular, but you won’t be able to focus on it for long as the breathtaking power of the boat whisks you away once more! It really is exhilarating stuff as you tear through the surf and be sure to keep your eyes peeled for dolphins which often follow the boat and jump in its wake. After your ride, you’ll have plenty of time to enjoy the warm sands and blue waters of Clearwater Beach before leaving for Orlando at around 5.00pm.